Djia Mambu is a journalist and film critic with a focus on African films. 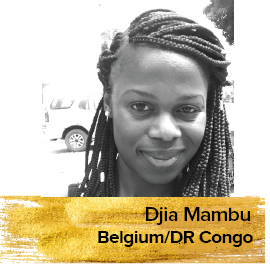 She joined the Congo International Film Festival Film (CIFF) Program team in Goma, DR Congo, and she is in charge of the Distribution for Madjiki Prod in Brussels. Djia is a member of the African Federation of Films Critics (FACC) and the International Federation of Film Critics (FIPRESCI). In 2018, she founded the VisuElles Film Festival, a film festival focus on female in the film industry.